“The Mt. Rushmore of…” is one of those quintessential sports discussion points because it’s such an easy notion to understand and because it provides you with a very simple but very rigid parameter. You can pick any four people or things to make your point but you can only pick four people or things. Mt. Rushmore has four guys on it, so that’s the deal. Easy stuff. 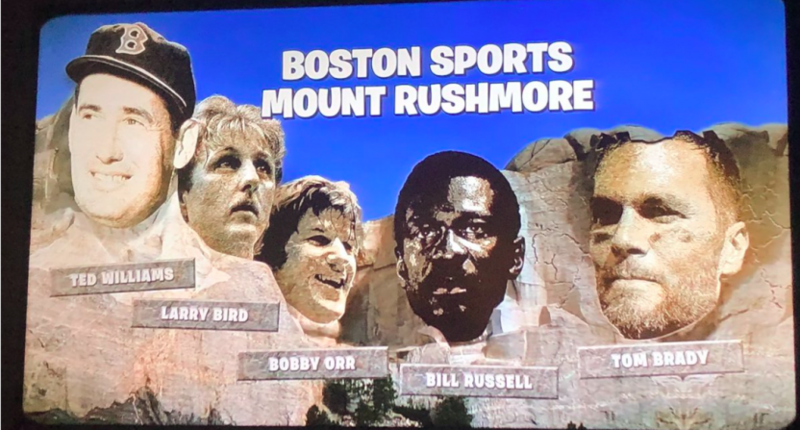 Not so much for Fox, who made their own Boston Sports Mount Rushmore on Thursday night during their TNF broadcast of the game between the New England Patriots and Indianapolis Colts. The Patriots cruised out to a 24-3 lead before the half, leaving the broadcasters with a need to fill some space. Enter Mt. Rushmore, albeit one that fails to meet the very simple parameters laid out. Yep, that’s a five-person Rushmore, which is not a thing and not how this works. To be fair, it’s very hard to narrow down Boston-centric sports legends to the best four ever. We’ll be the first to admit that. But, again, that is the point of the Mount Rushmore argument. You have to. You just have to. You can’t add a 5th face to Mt. Rushmore. That’s the point of the exercise. As for who the four people who should be on Boston Sports Mt. Rushmore, there are plenty of places where you can go have that argument. We’re not here to tell you who the four definitively are. We’re just here to tell you that you sure as hell can’t have five.